Monty Paulsen loves to create wine brands. He's an eclectic winemaker, making wine from wherever he can get his hands on grapes, be that Martinez, California or the Valle Central in Chile. On his website alone you'll find four brands with a total of 26 different wines. These days you'll find Monty behind the Pat Paulsen Vineyards tasting bar of his newly opened tasting room in Livermore Valley. If the name Pat Paulsen sounds familiar, here's why. Pat, Monty's father, was a comedian, who was well-known for his dry humor and deadpan delivery. Pat was a regular on The Smothers Brothers Comedy Hour TV show. He also ran for President of the United States multiple times, on a platform that was more comedic than political. When asked about this Monty says, "Dad did political stuff. I'm just president of the winery." 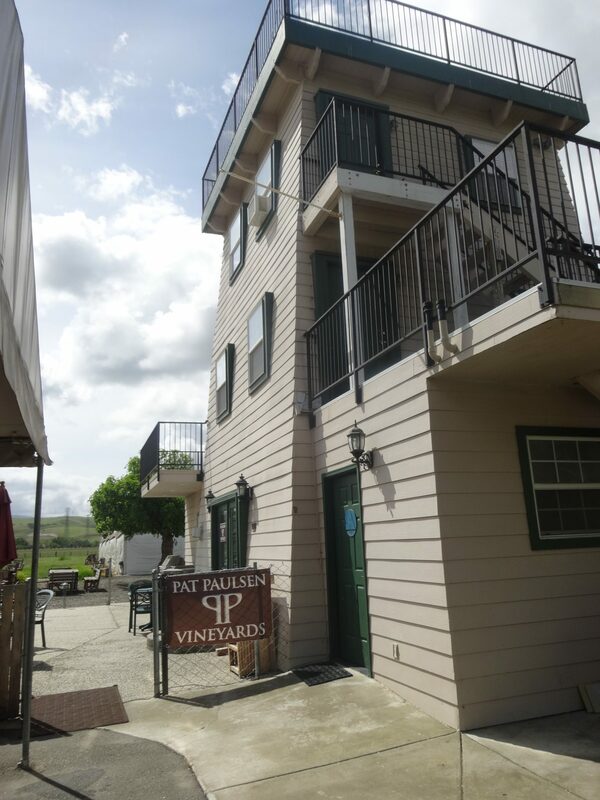 Pat also started his eponymous winery, Pat Paulsen Vineyards in the Alexander Valley of Sonoma County in 1971. Monty says they spent summers at his uncle's ranch in Healdsburg. "We were familiar with the area. And once there, we could either start a cattle ranch, or plant vineyards, so actually we did both," he says. "And then you either start butchering cattle, or making wine, and we already had enough meat in our locker, so we concentrated on the winery. Everything seemed to follow naturally." 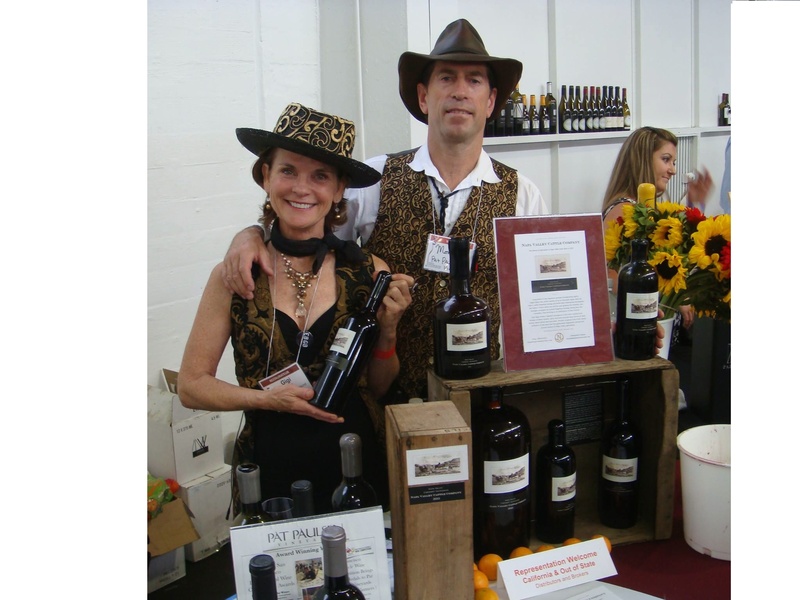 The winery was successful and outgrew its Sonoma venue, so Pat moved the winery to Napa. 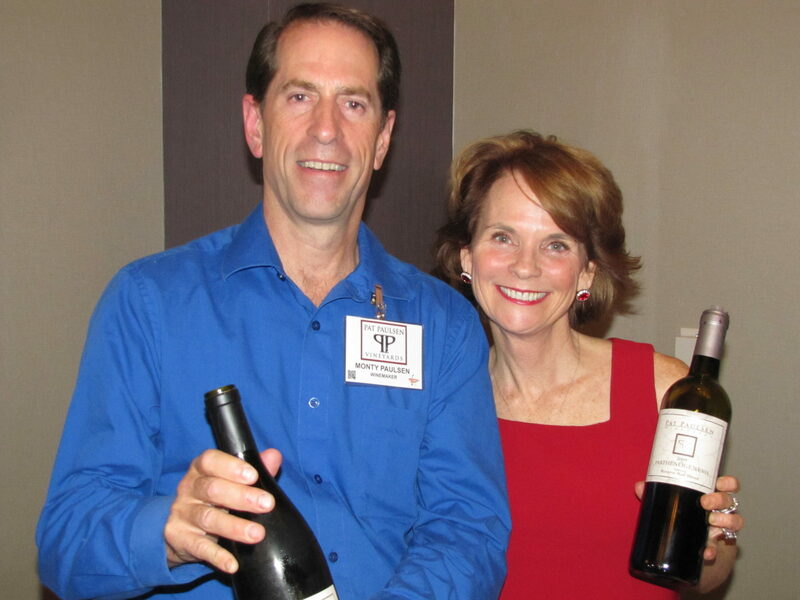 Pat didn't make wine; at first they had a UC Davis trained winemaker. Monty was involved in the winery from an early age and soaked up all he could. He also went to UC Davis and upon graduating went back home to become winemaker at Pat Paulsen. In the early 90's, with a recession and Pat's health starting to fail, they sold the winery and vineyards. But they kept the Pat Paulsen label. Monty went on to making wine for others, and eventually ended up at Rosenblum Cellars in Alemeda, California, where he became vice president of winemaking. When Rosenblum was sold in 2008 to Diageo, Monty went back to consulting and making wines for clients as far flung as China. But one question kept coming up. "Everybody kept asking me about Pat Paulsen wines, where's all the Paulsen wine," Monty says. "So I quit my day job and relaunched the label." 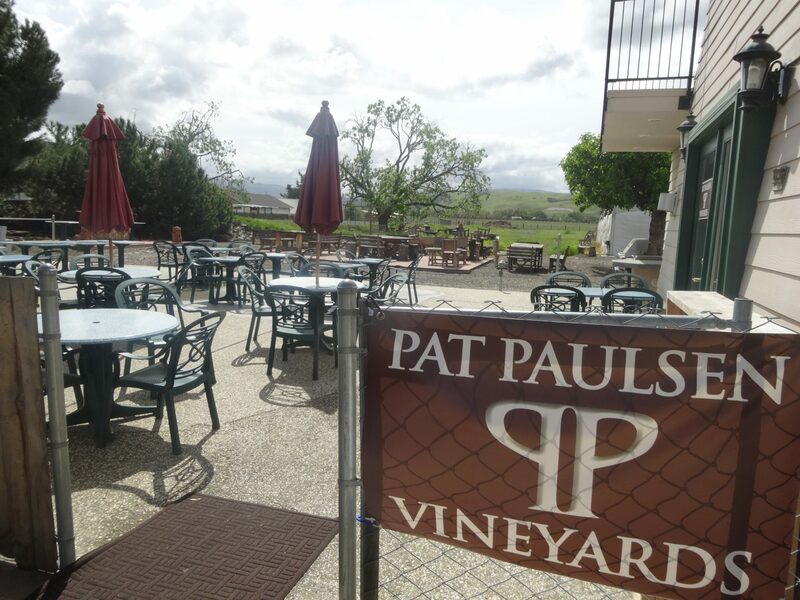 Pat Paulsen Vineyards has a new venue in Livermore on the Tesla Vintners campus, home to The Singing Winemaker, Steve Powell's winery and tasting room. "Steve told me he wanted to have other tasting rooms on the property, and that if I was thinking about it I could set up shop here," says Monty. He did just that. "I have my bonded facility here." Monty has moved much of his wine in barrel from Napa to Livermore and is also making wine here. The vision for Tesla is to become a community wine center. 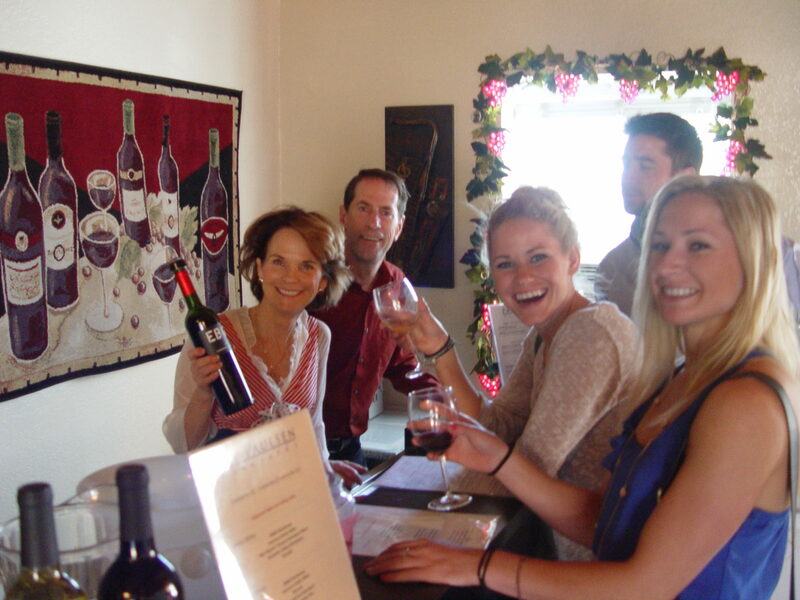 Pat has another neighbor, Ehrenberg Cellars, a newcomer on the Livermore wine scene. There are plans for an outdoor area for picnics and live music. Livermore is not new for Monty; he's been buying grapes from here. He also taught classes in the wine program at Las Positas College. He's also bringing in other labels that he's consulting on. A friend's wine, Rancho Las Juntas, is made with grapes from Martinez. Monty has many more brands he'd like to bring in if he had the space. Upon meeting Monty and seeing him in action, you immediately sense his dry wit and a bit of that deadpan delivery. He's affable and charming, and has story after story to tell. He jumps from topic to topic, all while pouring wine with a deft hand and tending to customers at the tasting bar. "This is the EGBG Chardonnay," Monty says, offering me a taste. He calls it an entry level wine, with the name and label designed to attract "a younger crowd that wants something simple and edgy." The name is a bit of a mystery. All he'll say is "it's rumored that EB stands for east bay, but that's only a rumor." The wine is fruit forward and zippy. Monty also makes a Cabernet Sauvignon under the EGBG label. He'll offer anyone who tags a bottle in a social media post a discount on this wine, another way he's appealing to a younger crowd. He pours the Mio Vigneto Sauvignon Blanc, which is part of Monty's "Guest Vintner" series. In this case the wine grower Dwight Busalacchi helped make the wine from his vineyard in Lodi. "It's from the eastern side of Lodi where it starts rising up into the foothills," Monty says. "It gets these breezes and cooler nights which is what you like for white wines." Indeed, the Sauv Blanc is crisp and fresh, with lots of citrus. Gothic Red is a wine Monty calls fun. He certainly had fun with the label, which is a riff on the classic painting by Grant Wood of a farmer holding a pitchfork standing with his daughter in front of their farmhouse. Here, Monty's parents Pat and Jane stand in, pictured in front of their winery tasting room in Sonoma. This label first debuted in the 1980s. It was so popular that Monty decided to bring it back. The wine is a Cabernet Sauvignon blend, soft and easy drinking, with earth, leather and baking spices. 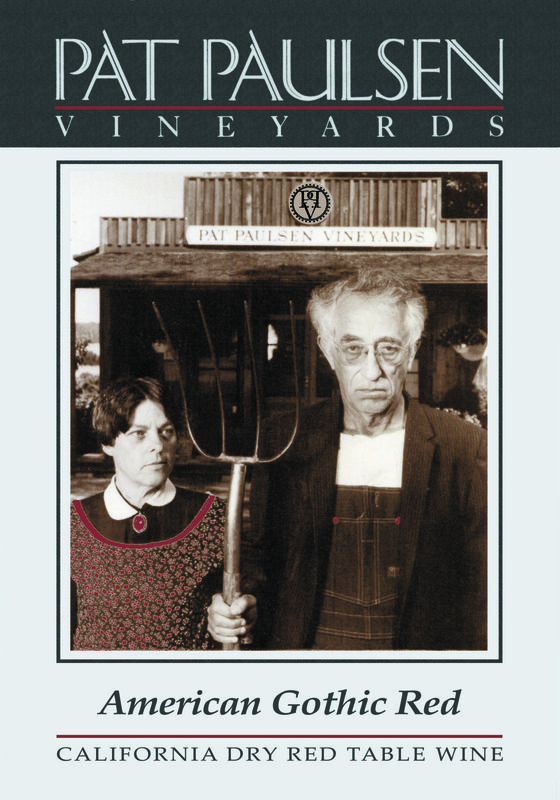 The Pat Paulsen Cabernet Sauvignon is a wine under Monty's "Heritage Selection" which he makes from vineyard sources that he and his family have worked with over the years. The Napa Cab is rich, dense, plush and complex with a long finish. One of my favorites of Monty's wine is under his Black Label. He started this category to signify wines with age. He says the collection has vintages mostly from 2003 to 2006. "Some people come in and they know older wines are a treasure and they go 'yeah I want to try these wines.'" It's a great opportunity to try older vintages if you've never had one before. I tasted the 2004 Mendocino Cabernet Franc. This wine has a brick red rim (due to age), stewed black fruits, lots of black pepper spice and a long, elegant finish. The other wine I love is Odyssey, a Syrah based wine a little Grenache and Zinfandel blended in, making it still very fruity and spicy. It has a silky texture and is just a seductive wine. Monty pulls out a Cabernet Sauvignon from his "Import Series." These grapes come from Chile, where Monty's been making wine for years. Wine & Spirits Magazine names it one of the "Year's Best Chilean Cabernets," which Monty can't help but find ironic, given that he's an American winemaker and that there's an American name, Pat Paulsen on the label. Monty's saved one of the best for last. Of course it has a story. And yes, it's another brand. He's launched Napa Valley Cattle Company with Napa Valley historian Doug Offenbacher as homage to Napa's roots as cattle country. The vineyards are on land settled by some of Napa's pioneers, including George Yount and Nathan Coombs. It's one of Monty's most complex wines, with black fruits, rose, tobacco and caramel. It has a chewy, dense texture. Monty says it is big and bold, perfect for a steak dinner. "I've probably been cranking out too many sub brands," Monty admits. "But I'm having a lot of fun."